We can able to show the “warning” message, when the disabled items in the DropDownList is hovered. This can be achieved by adding the additional span tag to the “li” elements of the DropDownList in the client side event called “create”. 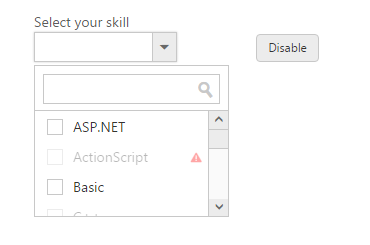 Upon clicking to the Disable button, certain element in the DropDownList will be disabled. 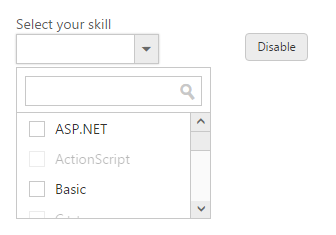 In the “create” event of DropDownList, we have appended the span element to the all items (li element) in the DropDownList. When hover to the disable items in the popup wrapper, the warning icon will be shown.